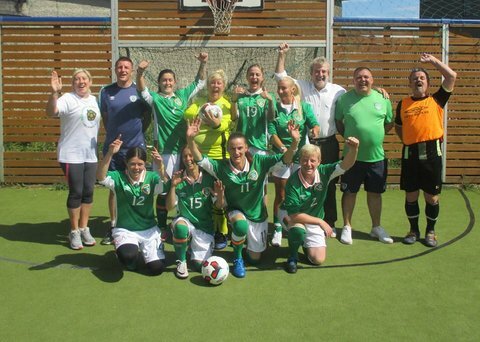 Dublin Simon Community’s Tara will be playing for the Irish women’s team in the Homeless World Cup in Oslo, Norway, starting today (29th of August). In addition to being the first person from Dublin Simon Community to participate in this event, she will be travelling as a part of Ireland’s first ever female team in the competition. The organisers of the Homeless World Cup say that the event is not just a competition, but a social movement that uses football to inspire people who are or have experienced homelessness and help them change their lives. The event will be taking place from August 29th until September 5th at the Rådhusplassen, The City Hall Square in Oslo. This is the 15th annual competition among 73 countries that implement street football programmes for men and women on the margins of their societies. Ireland has been a national partner of the cup ever since its founding, and Colin Farrell its celebrity ambassador. 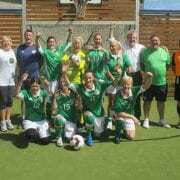 Tara impressed Ireland’s scouts in a competitive selection process where the most talented players are chosen to represent Ireland in August. Trials for the World Cup have been physically and mentally challenging. After being invited to the trials by several coaches, Tara declined, thinking that she wasn’t mentally prepared and that the timing just wasn’t right. After several phone calls from scouts and coaches, she decided to participate in trials where she was selected out of a great number of competitors to play alongside three other women. Tara says she also relies on the support of her family. Her son takes after her when it comes to sport, and her elder brother was the reason she got into football in the first place. Keep up to date with all of the latest World Cup news and results here.